Some people are just so clever! 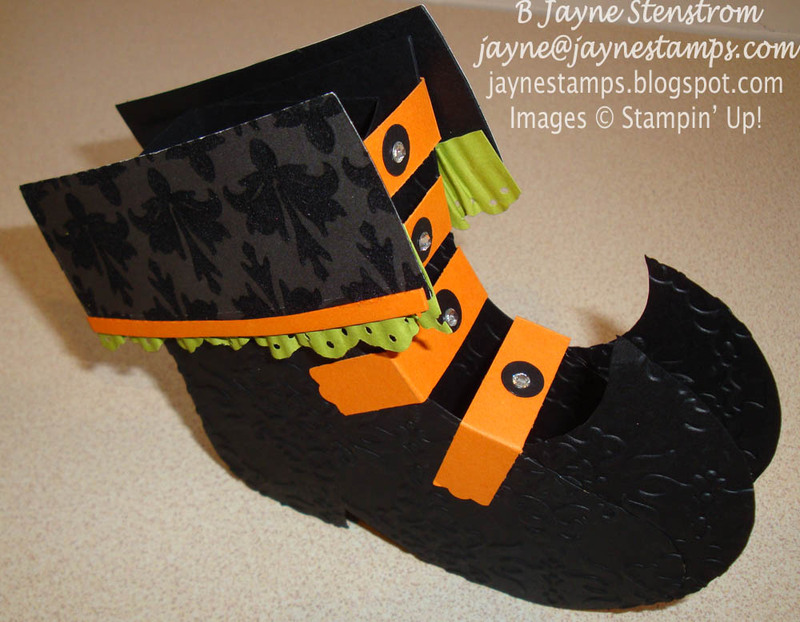 Would you believe that you can take the Holiday Stocking Bigz L Die and make a "witch's shoe" from it? I have seen these on various blogs, so when my friends came over on Friday for a little stamping R&R, this was one of the projects we made. 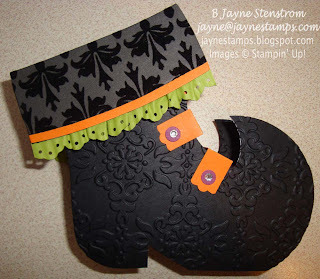 We cut out two of the stockings in Basic Black and cut two circles with the 3-1/2" Circles Originals Die. Then using the 1-3/4" Circle Punch, we took a "bite" out of the circle. After attaching the circle to the stocking, I ran it through the Big Shot with the Vintage Wallpaper Textured Impressions Embossing Folder. This helps to hide the "seam" where the stocking and the circle are attached. 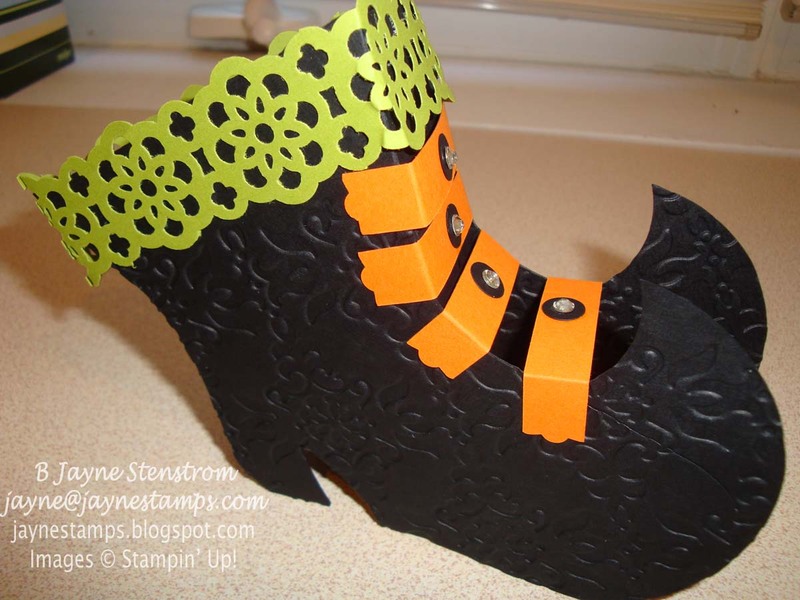 Between the two shoes is a box cut with the Box #2 Bigz XL Die with one end cut off. 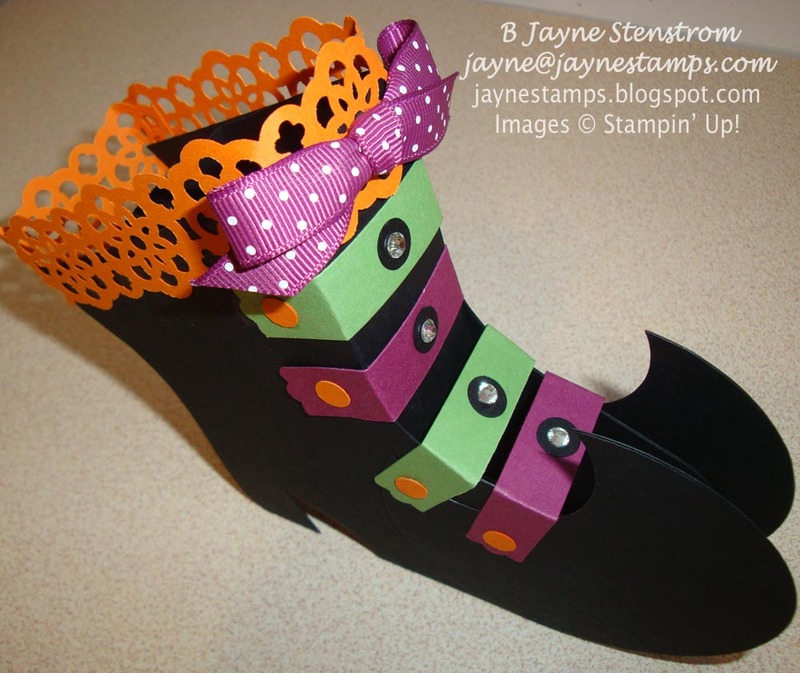 This is so you could tuck some goodies in the shoes to share with a special friend if you so choose. 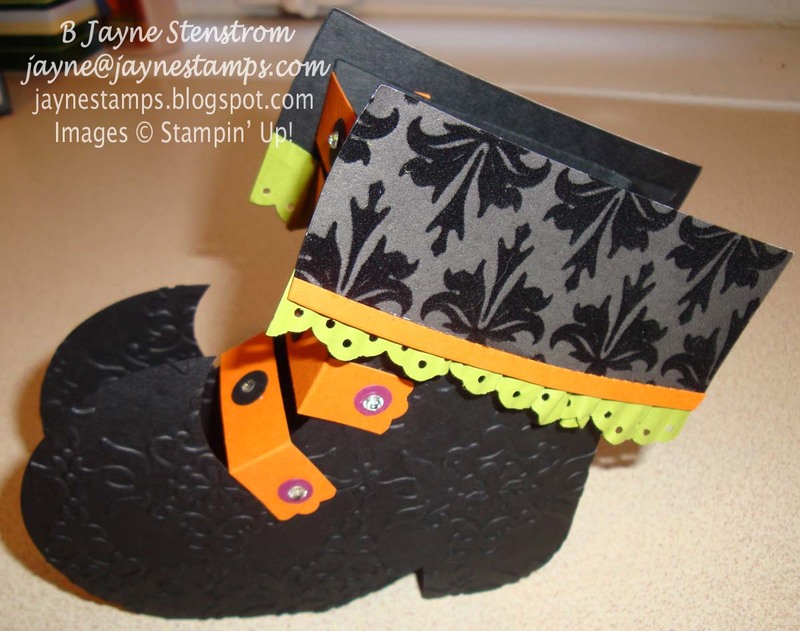 The black paper used on the top is from the Mocha Morning Specialty Designer Series Paper. This paper is gorgeous! The buckles on the shoes are made with the Modern Label Punch, but punched so they are longer than usual. I also used Lucky Limeade cardstock punched with the Eyelet Border Punch and run through the Crimper a few times to soften the paper fibers. Some circles punched with the Itty Bitty Shapes Punch and some Basic Rhinestones complete the look. What do you think? Everyone's shoe looked a little different. Here is Pam's creation (she was going to go home and add some additional bling to her shoe). And last but not least is Donna's shoe. These all turned out SO cute! 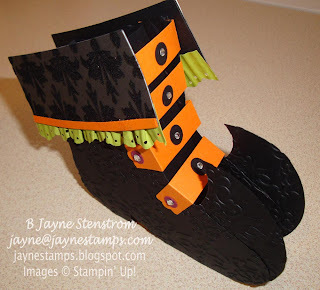 Stamping is always fun, but there's nothing like stamping with my buddies! Thank you to all of the ladies who have posted this idea on their blogs. I know that my creation was a compilation of the other ideas that I've seen. (I know this wouldn't have come to my mind on my own!) So now you have another reason to get this Big Shot die (which you KNOW you want)!